$29 Tix for Odets’ Rocket to the Moon! Ned Eisenberg, Jonathan Hadary and Lou Liberatore! In this rarely seen "Romance in Three Acts" by Clifford Odets, Ben Stark commences an affair with his secretary Cleo at the urging of his father-in-law, Mr. Prince. The encounter will change them all. 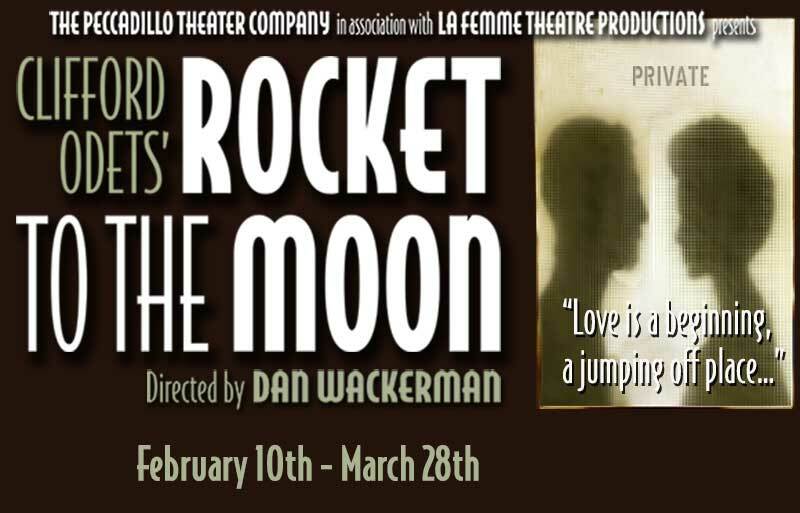 Rocket to the Moon is presented by the Peccadillo Theater Company (“an impeccable theater resource, a rare and vital treasure” - Hal Prince) in association with La Femme Theatre Productions. Tickets Only $29 with this Offer! Normally $75! February 10th through March 28th Only! One hour before performance only. *RESTRICTIONS: Regularly Offer may be revoked at any time and is subject to availability. Not valid on prior purchase. Offer cannot be combined with other discounts or promotions; blackout dates and restrictions may apply. Maximum of 10 tickets total with offer.